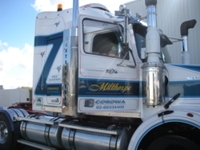 G.F. & R.J. Milthorpe operate a transport fleet servicing all parts of Australia on a regular basis. .
With an extensive Australia-wide network of depots, scheduled freight services and the flexibility to add services as dictated by customer requirements, we are able to offer our customers a service which meets all of their requirements in terms of reliability, freight integrity and cost-effectiveness. 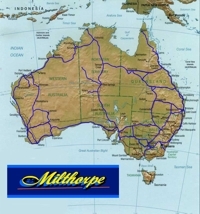 Services run daily between Corowa and Melbourne, twice-weekly to Adelaide, Sydney and Brisbane and weekly to Western Australia and North Queensland with all points in between also serviced on that basis. Services to all other destinations including Darwin, Central and North West Australia and mining communities are operated on a prompt, as-required basis. 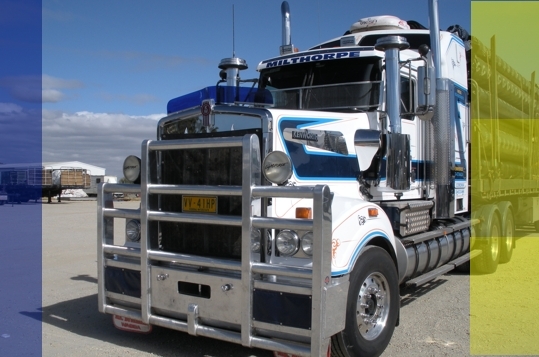 With extensive knowledge and vast experience in projects across the mining and rural sectors, G.F. & R.J. Milthorpe are specialists in the safe transport of heavy but fragile equipment and have worked closely with a number of our manufacturing customers in the design and engineering of equipment tie-downs. We also have strong experience in the safe handling of boats and motor vehicles with regular consignments all over Australia. With a large fleet of road-trains operated by experienced drivers we are able to expedite the movement of large amounts of equipment into remote areas in a very short time. Our depots at Corowa, Melbourne and Townsville are suitable for the secure storage and distribution of both bulk and packaged product and are staffed by personnel expert in managing this often demanding environment with quick turn around . We are able to offer complete managed solutions to meet your storage and distribution requirements. As a nationally accredited organisation, we pride ourselves on providing a safe environment for our employees, customers and the motoring public backed with industry standard policies, procedures and programs. With all drivers involved in a fatigue management program and all vehicles accredited for mass and maintenance management we believe this translates into a safer environment for our customers and their products at the same time making the roads a safer place for all users. Copyright 2010 @ Milthorpe Transport. | Terms and Conditions | Design by Jaix Software.